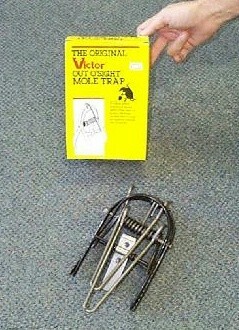 PRODUCT DESCRIPTION: This is a kill trap designed to be used on moles. It is used by first determining where the active mole den tunnel is located in the yard. Once found, depress the entire tunnel and place the trap over the middle section of it. 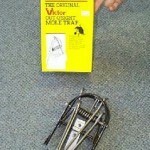 When the mole returns and pushes the dirt back up, he will set the trap off. This trap is different from the spear trap in that it has a lower profile and does not spear the animal. It clamps them from the side.